GUAVA SEED OIL – extracted from organic guava seeds. Guava is the richest source of Vitamin C, antioxidants, phytonutrients, and flavonoids. These protect the skin from oxidative damage caused by free radicals, which can damage DNA of cells. Once DNA is damaged, skin wrinkling begins. Guava contains Vitamins E, K, pantothenic acid, Vitamin B6, niacin, and folic acid. It has unusual minerals such as copper, manganese and magnesium. These all help to slow down the aging process, and make skin unusually soft and supple. Internal use – 1 teaspoon in the morning on an empty stomach, and 1 teaspoon in the evening before bedtime. Or pour over your food, unheated. The antioxidants lower blood pressure, the pectin lowers the level of cholesterol in blood. Unique plant actives neutralize the effect of nicotine, helping smokers who are trying to quit, and aiding those who have inhaled second-hand smoke. Guava Oil contains more potassium than bananas, so it is a remedy for those wishing to lose weight which is caused by water retention, as potassium causes the body to shed excess water. Many people have reported that Guava Seed Oil massaged into your scalp regularly, helps to control dandruff. 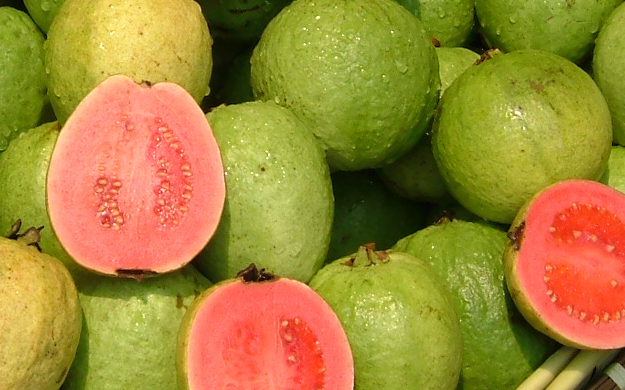 Guava Oil promotes skin toning and firming, due to its astringent properties. It fights acne, and over time, reduces pore size.